File boxes are one of those things you don’t really think much about until you are faced with the task of organizing bills, research papers, or even your winter wardrobe. File boxes are a great place to store magazines, artwork, pictures or even CDs and DVDs. They come in all sorts of sizes and materials and can go with just about any décor with just a little bit of thinking ahead. Not all files need to be kept forever. For example, if you are a college student who is taking a full load of classes, you might be chasing a number of different bits of paper for your class work. Even in this age of online classes and digital files, instructors often hand out a syllabus, how-to instructions, review sheets, and more. Writers are another group that might keep temporary files for a project. Once the semester is over or the project is done, those files are often of lesser value. The important pieces can be filed away in a more permanent venue, while the less important can go to the shred bin. If you keep pictures, magazines, patterns, recipes or similar items, you might want to have a place to keep them in order. A decorative hanging file box is often the answer for keeping your special quilt patterns in order. An old-fashioned recipe box can be just the thing for protecting those family heirloom recipes. You never know when you might need them. While not in a class with fire-proof safe boxes, a sturdy file box with a lid can be a protective place for those items of moderate value that you want on hand. Such boxes need to be water resistant, mouse resistant, and flame retardant. Items that might be stored in them could include family pictures, insurance policies, copies of various deeds or titles – items that probably are registered and retrievable from other venues, but that are convenient to have on hand. A decorative storage box can come in all sorts of sizes and styles. Let’s explore some of your options. Handy, easy to assemble, tough corrugated box that can handle hanging files is just the thing to tame that paper snowstorm that seems to turn up in even the best-regulated households. These files are stackable and storable. However, they are not impervious to damp or mice. They are, however, handy for temporary storage of assorted papers. Decorative, stackable and storable, these decorative boxes can help make sense out of papers ranging from monthly bills to research for that all-important thesis. With a space on the end to add a label and good handles to help move the boxes, they are an excellent solution for sorting and storing papers, especially short-term. Tame your bills, bank statements and more with Snap N Store letter-size file. Black in color, it will go with any décor, and its easy snap together assembly is convenient and easy. It is a step up from the corrugated folding file box and has a large lid to accommodate hanging files. It is also a handy place for magazines or comic books. Enjoy a stylish way to conceal the ever-lasting paper flood that seems to plague the modern home. The flip top makes it easy to conceal personal information, and the woven seagrass and wire exterior create a stylish addition to the corner of your home office area. It could also be an attractive place to file sewing patterns or magazines. Honey Can Do brown wicker woven file basket with lid offers an attractive, durable solution to filing papers, magazines, patterns or other items. Whether you are tidying up the entertainment center, the bathroom or organizing that endless stream of paper that goes with managing a household, the option for hanging files and wheels helps with decluttering. Charming wicker letter file with traditional organic weaving material. The lid is a loose fit, and the box might not be completely dust free in spite of advertising. A good choice for living room or family room to file magazines, correspondence or similar letter-sized items. Purchasers should be prepared for some imperfections due to organic materials used. The Scout Hang-10 collapsible, reinforced, water-resistant storage bin will make your day if you need temporary or intermittent storage for various items. It unfolds quickly and easily for use when you need it, then equally easily collapses so it can be stored when not needed. Great for those seasonal or occasional storage items, and no need for repeat purchase of storage. 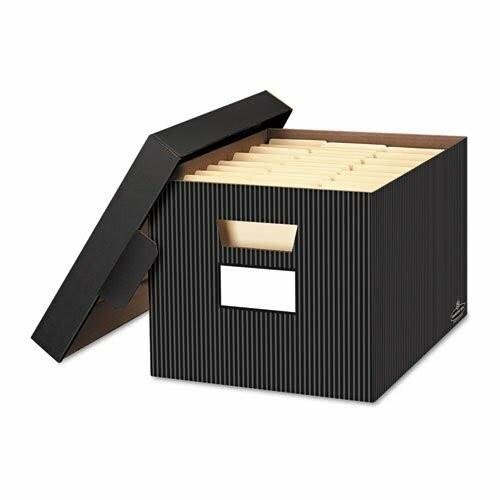 The Spruce storage letter sized hanging file box is the perfect place to keep those semi-important papers, such as copies of insurance policies, or the contract for the streaming television service. Faux leather interior and exterior in shiny metallic gray adds a touch of class to this file box. You can easily set it on a shelf in your office or living room. Whether you are storing your winter woolies or insert a frame for hanging files, you are going to love this nestable 2-bin set of foldable storage bins with lids. Sturdy cloth-covered cardboard is advertised to be moisture proof and non-combustible. Light enough to be a kids’ toy box, but also sufficiently sophisticated to tidy up the home office. As most busy cooks know, file cards are the best way to keep up with favorite recipes. No need to drag out the heirloom cookbook or that hard-to-find copy of the Culinary Institute Cookery Book to access grandma’s famous birthday cake or that goulash that everyone raved over. The Victoria Albert Museum William Morris style file box with lid will keep your recipes in style.